HYDE, Pa. – Nine different Clearfield batters scored at least a run and earned a 22-12 victory over visiting Brookville. Caullin Reed led the Bison scoring attack going 5-for-6 with four runs including a homer while driving in five. Nick Domico doubled and had three RBIs while Kyle Elensky and Harrison Peacock each scored three runs. Cade Walker doubled and scored twice with Eli Glass picking up three hits and two runs. 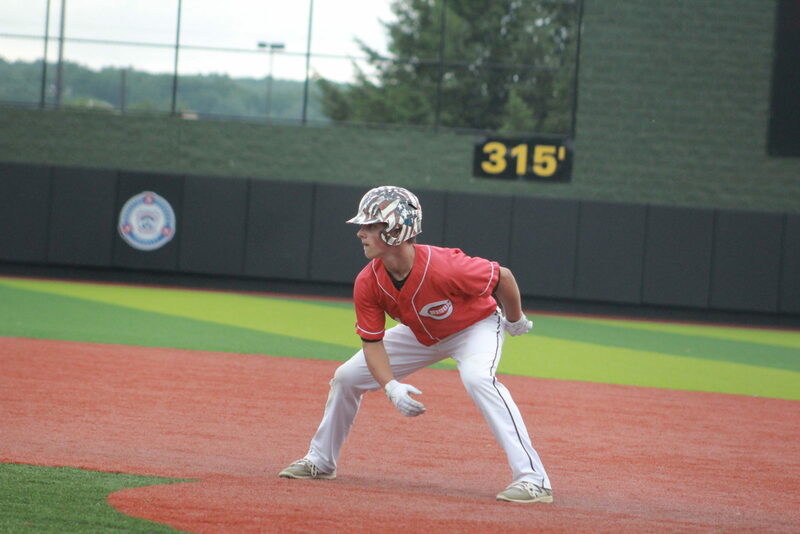 Nathan Barr went 2-for-4 scoring both times at bat while driving in three scores. Jace Miner paced the Raiders with three runs. Aaron Park doubled and scored twice while driving in four runs and Seth Dunkle chipped in for a pair of hits with two runs. Hunter Hipps started the game on the mound for Clearfield and gave up seven hits and nine runs with a strikeout in two innings. Peacock pitched 3 ⅓ innings and struck out three batters while allowing three hits and three runs. Miner lasted two innings for Brookville and struck out two while allowing six runs and five hits. The rest of the Raiders pitchers combined to throw three strikeouts and allow 11 hits and 16 runs. 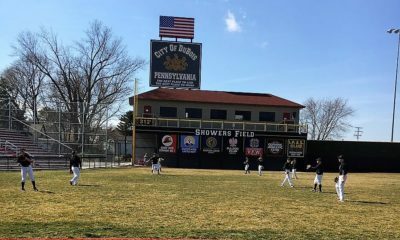 DUBOIS, Pa. – Chandler Ho doubled and drove in Chase Husted for the winning run in the bottom of the eighth as DuBois earned a 4-3, walk-off victory over visiting Punxsutawney. Ho led the Beavers with a pair of hits and two RBIs while Eric Schneider went 2-for-3 with a run. Jordan Frano doubled with Heath Means chipping in for a score. Alec Greenblatt went 2-for-2 with a pair of runs and an RBI to pace the Chucks. Daren Byers had a team-high three hits while Aiden Johnston added a run. Garrett Starr started the game and allowed eight hits and three runs for DuBois. Ho pitched the final two innings and earned the victory with two strikeouts and one allowed hit. Byers took the loss giving up three hits and the winning run for Punxsutawney. Greenblatt pitched the first six innings and struck out three while allowing six hits and three runs. PAINT TOWNSHIP, Pa. – Moniteau rallied from a 4-2 deficit in the first inning to defeat Clarion, 7-5. Hunter Fitzingo led the Warriors with two runs while Gage Neal doubled and added a score. Jared Lominski singled and drove in three runs with Lee DeMatteis doubling on his way to a score. Kriebel had a team-high three RBIs to go along with a double to pace the Bobcats. Cole Slaugenhaup doubled and scored one while driving in once score. Chance Nagy got the win with four strikeouts and two allowed hits in the win for Moniteau. Nate Datko pitched 3 ⅔ innings for the Bobcats and took the loss giving up three hits and two runs while striking out five. SMETHPORT, Pa. – Brandon Higley drove in three scores to lead Smethport past visiting Galeton, 18-7. Higley went 3-for-3 including a double and triple along with a score to led the Hubbers. Nate Hollowell scored three times with Cristo Speedy adding a pair of scores. Kameron Rounsville tripled on his way to a score while Travis Cooney doubled and drove in a score. Noah Costa went 2-for-3 with a pair of runs and two RBIs. Tre Slawson paced the Tigers going 2-for-3 with three runs while Brandon Ruef and Hunter Crowell each had a multi-hit game. Alex Ognen pitched the first three innings and struck out five while allowed three hits and three runs in the win for Smethport. Higley pitched the final three innings and gave up two hits and struck out seven batters. Slawson took the loss for Galeton giving up seven hits and nine runs while striking out four in three innings on the mound. KNOX, Pa. – Tanner Merwin went 2-for-5 with a pair of scores and two RBIs to help visiting A-C Valley defeat Keystone, 6-3. Broc Weigle doubled and added a score for the Falcons with Levi Orton hitting a pair of singles while scoring once. Tony Thompson singled on his way to a score with Zeke Causey adding a run. Tye Elder and Conner Exley each doubled and added a score apiece to pace the Panthers. Brooks LaVan singled and drove in a run with Dawson Steele chipping in for a run. Luke Whitcomb struck out seven batters and gave up five hits and three runs in the win for A-C Valley. Steele took the loss for Keystone giving up four runs and three hits in three innings on the mound. Troy Johnson pitched the final four innings in relief and struck out five while allowing five hits and two runs. SHINGLEHOUSE, Pa. – Brandon Murray went 3-for-5 with a run and four RBIs to lead visiting Portville (N.Y) to an 18-0, five-inning victory over Oswayo Valley. Maxwell Yehl doubled and scored twice for the Panthers while Nathan Kloc and Cameron Lott each scored two runs. Sawyer Prince paced the Greenwaves with a pair of hits. Colton Gietler doubled and Carter Stedman singled. Nathan Kloc earned the win for Portville striking out five batters and allowing no hits in two innings. Nathan Petryszak pitched the final three innings in relief and gave up four hits while striking out three. For Oswayo Valley, Noah Wichert struck out seven and allowed two hits and six runs in the loss. MARIENVILLE, Pa. – Bryson Bain and Jimmy Gundlach combined to throw a no-hitter as visiting Redbank Valley defeated Forest Area, 16-1 in three innings. Bain threw the first inning and allowed one earned run off a walk. Gundlach pitched the final two innings and the two pitchers combined for six strikeouts. Blaney Brooks led the Bulldogs offensive attack going 3-for-3 with a triple and three runs with two RBIs. Hunter Buzard doubled and scored three times while driving in two runs with Kobe Bonanno hitting a triple and a double before scoring twice. DUKES CENTER, Pa. – Otto-Eldred rallied to defeat visiting Portville, 10-9. The Lady Terrors led 8-1 at the top of the seventh before allowing the Lady Panthers to score eight straight runs and take a 9-8 lead. Otto-Eldred loaded the bases in the bottom of the seventh and tied the game back up on a passed ball. Haylee Fredrick scored the winning run on a dropped third strike where the runner safely advanced to first. Gabby Nickerson went 3-for-3 for the Lady Terrors while Kaylee Heller tripled and drove in a score. Emmalee Sheeler tripled and Abby Wolfe had a pair of hits that included a double. For the Lady Panthers, Sierra Keim homered and drove in two scores while Brooke DeYoe doubled and had an RBI. Wolfe earned the win for Otto-Eldred with three strikeouts while allowing 10 hits and a walk. DeYoe took the loss giving up 12 hits and walking three while striking out one batter. SPRING MILLS, Pa. – Penns Valley scored two runs in the bottom of the seventh to earn a 4-3 victory over visiting Clearfield. Trailing 3-2 in the bottom of the seventh, Lydia Collison tied the game for Penns Valley on a Kailen Winkelblech single and Kaylah Thompson scored the winning following an Avelyn Van Heyst single. Thompson and Winkelblech each had three hits for the Lady Rams with Kendra Bumgardner adding a score. Emma Hipps paced the Lady Bison with a pair of hits and two RBIs. Lauren Ressler doubled and Karly Rumsky recorded two hits and a score. Kylee Hertlien doubled on her way to a score. Bumgardner gave up nine hits and three runs while striking out five in the win for Penns Valley. For Clearfield, Hipps struck out 11 batters but gave up 10 hits and four runs in the loss. KNOX, Pa. – A-C Valley used a balanced scoring attack to defeat Keystone, 14-0 in five innings. Baylee Blauser led the Lady Falcons going 3-for-4 with a triple and three runs. Emily Wetzel scored three times while Cam McNany tripled and drove in three scores. Sydnie Schmidt and Kelsie Terwilliger each had a pair of hits with Andrea Meals adding a double. Allie Champluvier paced the Lady Panthers with a pair of hits while Alyssa Dunlap added a hit. Blauser got the win for A-C Valley striking out four batters and giving up two hits. Alexandria Johnston took the loss giving up 12 hits and 14 runs in the loss for Keystone. EMPORIUM, Pa. – Laila Smith went 3-for-4 with a pair of runs while driving in four to help Cameron County defeat visiting Port Allegany, 12-1. Alyvia McKimm had three hits and scored twice for the Lady Red Raiders. Allyson Narby doubled and added three scores while Taylor Lamont and Kaitlyn Burgett homered. Cailey Barnett had a pair of hits and an RBI to pace the Lady Gators. Jenn Sprankle tallied the lone run. Smith struck out 11 in the win for Cameron County and allowed three hits and a run in the circle. Jade Evans struck out three while allowing 11 hits and 12 runs in the loss for Port Allegany. 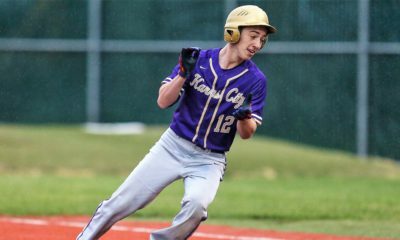 SMETHPORT, Pa. – Jesse Evans scored three runs and drove in two to lead visiting Galeton over Smethport, 15-0 in five innings. Evans went 2-for-4 with a double for the Lady Tigers while Reagan Fuller went 3-for-4 with a run. Cara Parsell doubled on her way to a score and Maddie Sauley chipped in for three hits. Baylea Strom paced the Lady Hubbers with a pair of hits and Baylee Arnold added a double. Fuller earned the victory for Galeton throwing six strikeouts and three allowed hits. MARIENVILLE, Pa. – Scoring 18 runs in its first two at-bats, including 10 in the second inning, visiting Redbank Valley cruised to an 18-1 three-inning win via the 15-Run Rule at Forest Area. The Lady Bulldogs blasted four home runs — all “inside the park” since there is no outfield fence at the East Forest High School field — with Montana Hetrick and Brooke Holben hitting a three-run and two-run shot respectively in the second inning. Shylie Shreckengost hit a solo home run and Gabby Dinger ripped a two-run shot. Holben went 3-for-4 with four runs batted in. Dinger and Teja Hageter each had two hits. Hetrick drove in four runs. In the circle, Holben and Hetrick combined on a three-hitter. Holben threw the first two innings and allowed two hits with no walks or strikeouts. Hetrick allowed a hit and run in Forest’s third inning.